Home CDN , children , crafts , December , feature , holiday , holidays , homeschool , papercrafts , printables , US , worldwide December 28th - Freebies! • The word chocolate comes from the Aztec word, Xocolatl, which ironically means bitter water. • The biggest bar of chocolate ever made was created in 2000 and weighed 5,000 pounds. Turin is the city in Italy who can be proud of this accomplishment. 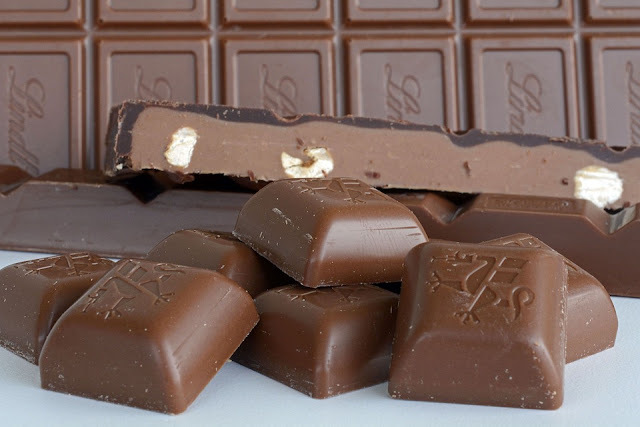 • While the US produces the most chocolate and consumes the most pounds every year, the Swiss consume the most per capita, followed closely by the English. • Chocolate manufacturers currently use 40% of the world's almonds and 20% of the world's peanuts. -- Whether you like your chocolate gooey and rich, creamy and smooth, or nutty and dark, this Storey BASICS® guide shows you how to make your favorite sweet treats right at home. Bill Collins provides illustrated step-by-step instructions for a variety of chocolate-making techniques, including tempering, thickening, sugar boiling, mold filling, piping, and more. You will soon be showcasing your confectioner's skills in decadent chocolate-dipped fruits, indulgent nut barks, and fudges that melt in your mouth. • KOHLER Chocolates Assorted Terrapins -- Move over, Turtles. The elegant Terrapin has arrived! Their gift box offers the ultimate 32-piece selection of Terrapins, original Wisconsin treats reimagining chocolate turtles with exquisite new tastes and textures. Savor all four flavors: Original Buttery Terrapins with milk chocolate, caramel, and pecans; Blackstrap Terrapins with dark chocolate, molasses caramel and walnuts; Java Terrapins with dark chocolate, coffee caramel and pecans; and Cranberry Terrapins with white chocolate, raspberry caramel and peanuts. Lovingly handcrafted in Wisconsin with premium ingredients like fresh local dairy cream and artisanal chocolate. • Moose Toys Chocolate Bar Maker -- Unwrap your creative talents with the new Chocolate Bar Maker. The innovative silicon pods make it safe and easy to use. The deco pen, stamps, and wrappers allow you to creatively personalize your own designs. Give your choctastic creations to friends and family, or eat them all yourself! YUM! ♦ 33 tons of antibiotics. - Did you know during the Second World War, the U.S. Government commissioned Milton Hershey to create a candy bar to be included in the soldier's rations? The candy bar chosen was the famous Hershey Milk Chocolate Bar. To celebrate National Chocolate Candy Day, enjoy some of your favorite types of chocolate candy. You can start your diet tomorrow, right? - The perfect time to spend an hour or so playing cards with family and friends. A day to keep alive games which have survived for centuries as a form of entertainment. We are encouraged to pass on the old traditions of playing cards. - You know you have been meaning to call for weeks... don't put it off another minute – call your friend today. If you have been avoiding the call because you just don't know what to say – try Hello – it is Call a Friend day, and I thought of you. - The US Congress officially recognized the Pledge of Allegiance on December 28, 1945, and urged its frequent recitation in America's schools. The pledge was composed in 1892 by Francis Bellamy, a Baptist minister. – Nearly everyone has exchanges to make after all that holiday gift-giving. Offer to do this time-consuming task for your friend. - To continue the tradition of quilting through education and service. It can be a day to gather and work on an existing project, or to start a new project. What have you quilted lately? - Interruptions are a normal part of work life, especially if you are a smart and talented worker or manager. It is natural for your colleagues and staff to want to talk to you if you can help them with their work. That being said, interruptions can also be a tremendous drain and time waster. I would LOVE a No Interruptions Day! - President Richard Nixon signed the Endangered Species Act into law on December 28, 1973. - The Massacre of the Innocents is an episode of infanticide by Herod the Great appearing in the Gospel of Matthew (Matthew 2:16-18). Matthew relates King Herod ordered the execution of all young male children in the village of Bethlehem, so as to avoid the loss of his throne to a newborn King of the Jews whose birth had been announced to him by the Magi.